inRoute 6.4 has been released, now with routing to up to 150 locations, and interface updates to make planning your routes faster and easier. Pro plans can now create, import and optimize routes with up to 150 locations. A new icon (More Options) replaces the prior Action/Share icon for common tasks. This provides quicker access for actions like saving, clearing and importing routes, with sharing to 3rd party apps now grouped under the Share button. Swipe right from the left edge of the screen to close most fullscreen windows on iPhones. On larger screen iPhones this is often easier than reaching to the top corner’s Done button. New option to restore previous revisions of your Bookmarks has been added to Settings. Revisions are stored locally on your device and backed up with your device backups. A close button has been added to Charts, in addition to the previous toolbar button. iOS 11 or higher is required for this release. 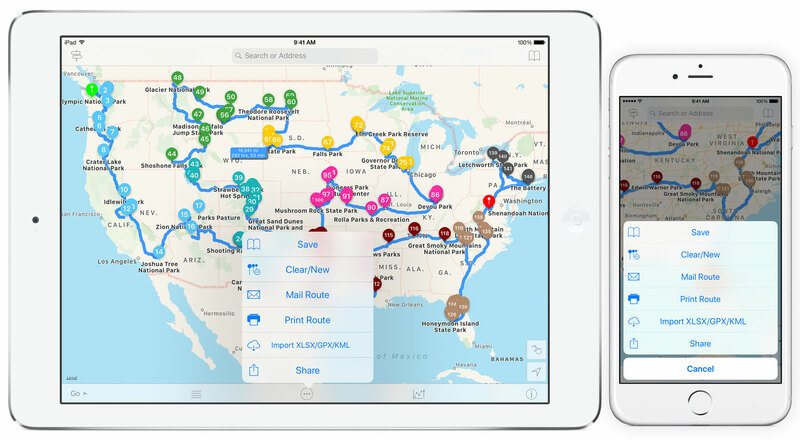 Users running previous iOS versions can still download the previous inRoute release compatible with their device.